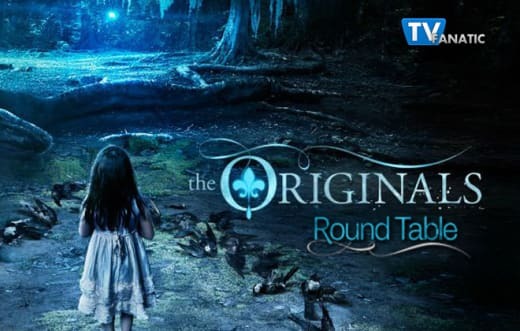 The Originals Round Table: Which Brother Will Die? 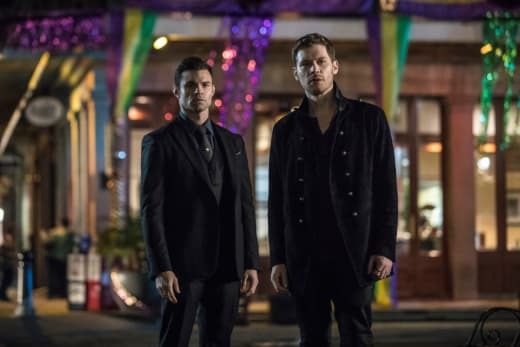 That was the big question after The Originals Season 5 Episode 12, and TV Fanatics Lizzy Buczak, Justin Carreiro and Paul Dailly weigh up the options below. Which character would you prefer sacrificed themselves: Klaus or Elijah? Lizzy: 100% Elijah. It's the only thing that makes sense and would leave fans satisfied. His sacrifice would be the ultimate gift to the brother he's dedicated his whole life to. 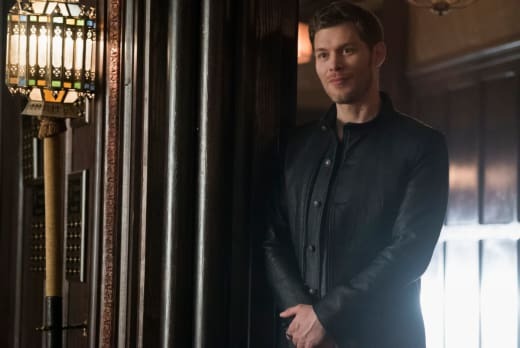 Klaus has redeemed himself and needs to be around for Hope and Caroline. Plus, Elijah wants this so he could finally be reunited with the love of his life. Justin: Definitely Elijah over Klaus. Elijah has already lost so much, and him sacrificing himself would reunite him with his love. His storyline has always been about honor and family; this would complete the plot. Paul: I agree with Lizzy and Justin. Elijah is done with his life and is ready to move and find peace with Hayley on the other side. I don't find anything remotely satisfying about Klaus dying. Now that we know Hayley has found her happy place, have you changed your thoughts on the way her death was handled? Lizzy: Nope. I still don't think she deserved to die and it wasn't necessary for the storyline, it was done for shock-value. However, I am happy that she's found peace and reunited with her parents and Jackson. I'd like to think that's what the afterlife holds for all of us. Justin: Not at all. Sure, it’s great to know that she’s happy on the other side, but the lead-up to it all was underwhelming. She was gone for so long and then just died. She deserved better. Paul: I'm on the fence. Her death was handled terribly. It felt like a slap in the face to fans of the character, but getting to see her actually happy on the other side is a little heartwarming. With that said, Hope is without a mother, and to me, it feels like the death was a way to make a reason for Hope to return to the school without her mother in tow. 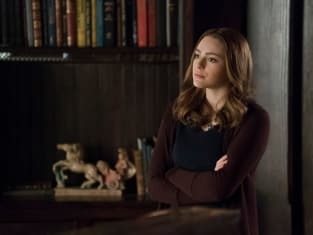 Did the trip to Mystic Falls make you more or less excited for Legacies? Lizzy: It made me miss The Vampire Diaries, that's for sure. I felt so old -- like I was returning to my hometown for my high school reunion or something. It was weird to see that nothing had changed, but everything was different. I am glad that the series is coming back to its roots, and we get to see a closer look at the Salvatore School. Justin: I’m so excited for Legacies! Like Lizzy said, it’s like going back to the beginning. Things obviously are going to be different than The Vampire Diaries, but it’s great that the world keeps growing. Paul: I agree. The Vampire Diaries is one of my favorite shows of all time, so I was nostalgic about returning to some of the key locations. With that said, it's going to be difficult to get on board with not seeing a lot of the regular characters on an episodic basis in Legacies. The spin-off is either going to be really good, or really bad. The Mystic Falls storyline concluded after the Hellfire almost destroyed it, so I'm not sure the magic school plot will be able to sustain itself over a longer arc. Also, Candice King being MIA will make it much more difficult for me to enjoy. 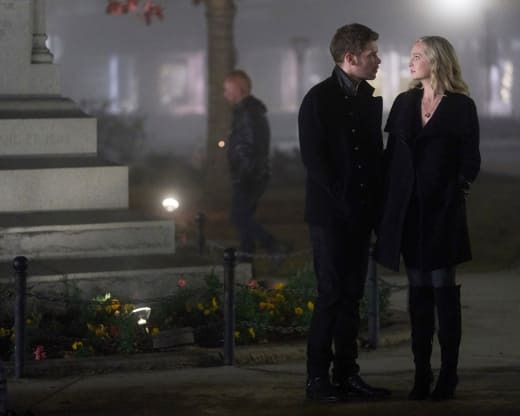 Do you think it's possible that if Klaus survives the series finale, he and Caroline could wind up in a relationship? Lizzy: It's very likely. We haven't gotten the Klaus and Caroline kiss, so I'm going to say he definitely survives at least until the final episode. 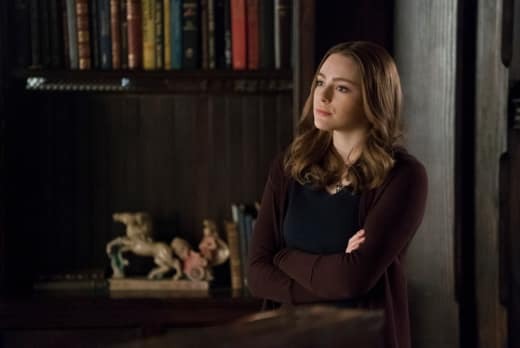 And since she isn't in Legacies, I'm willing to bet it's because they get their happily ever after. They both deserve it, don't they? He lost Cami, she lost Stefan, but they've always had this undeniable connection. Justin: They will be together in the end. Fans want them together, and it’s the happy ending people have been waiting for with them for years. If they don’t, it could pose some ill will going into Legacies. Paul: The Originals Season 5 has utilized Candice King as Caroline to remind fans that there's always the possibility of them getting together. It would be a real shame if all of those appearances resulted in them deciding against a relationship. What do you want to happen before the series concludes? Lizzy: I want Marcel and Rebekah to work things out, I want Freya to finally live her life instead of making sacrifices in the name of family, I want Klaus to find some happiness, and I so very badly want Elijah and Hayley to have that dance. And maybe some Kol and Davina babies? Wouldn't hurt. Related: Legacies: Which The Vampire Diaries Stars Will Appear? Justin: I want The Originals all to have happiness that won’t be tarnished for the sake of Legacies. Give me redemption for all of the main characters who don’t have it, and Rebekah to have the happy ever after she’s always wanted. Paul: I want them to sort out all of their differences, redefine what "Always & Forever" means to them, and live a fulfilled life. They've always carried the weight of the world alongside them, and their very existence has made their day-to-day life a burden. I'll be happy if they find love and happiness. That's about all I can ask for at this stage. What are your thoughts on the questions? Remember you can watch The Originals online right here via TV Fanatic. Get caught up on all the action. The Originals concludes Wednesday at 9/8c on The CW.